The name of this fashion is a Jem song title. Skip here for a listing of other depictions of Broadway Magic (cartoon, prototypes, catalogues, etc). 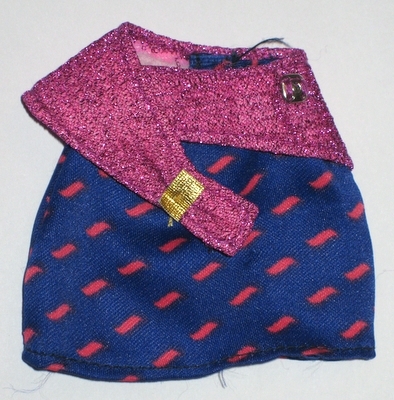 Pink and blue miniskirt: Dark blue spandex with pink squiggles design, raspberry stretch-sparkle fabric "belt" with gold lamé and jewel decoration. It is quite likely that the skirt came with the same velcro variation as the jacket; that being it could come in white or navy blue. long skirt/cape: Hot pink with gold lamé circle on closure. top: Sheer white tank top with iridescent fibres, velcro closure in back. Looks like the same material as the gloves from the Show Me The Way Video Madness Playset. 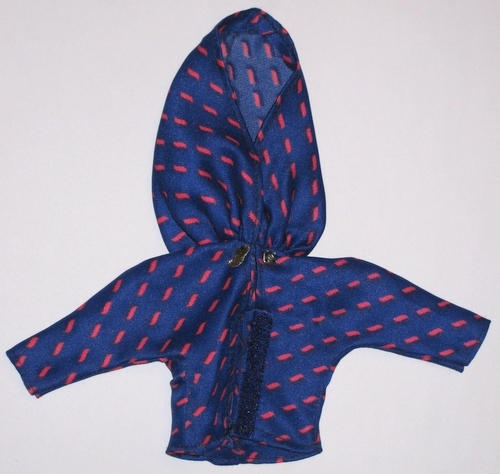 hooded top: Dark blue spandex with pink squiggles design. 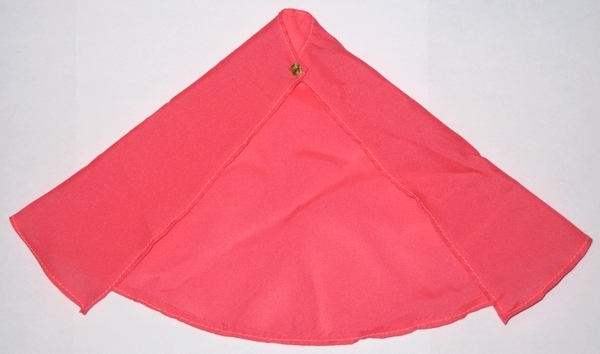 Velcros in front with a snap at the collar. The velcro on the jacket can be either navy blue, or white. I am not certain which is rarer. 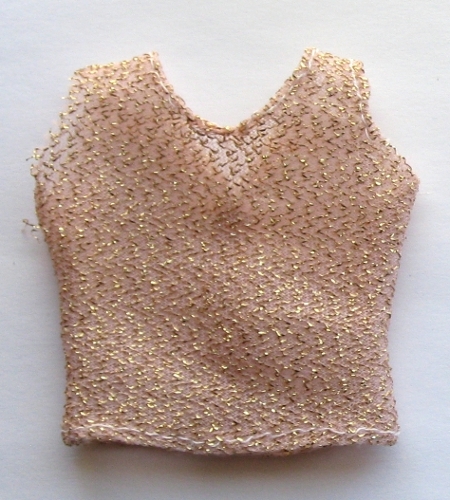 hose: pale pink with gold threads. 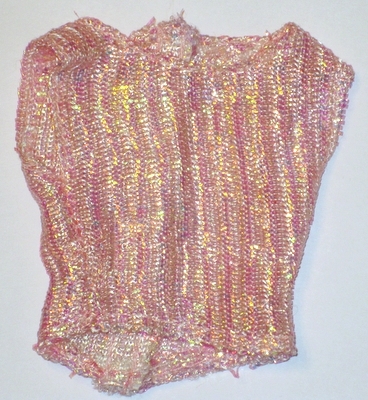 pale pink tights with silver threads are from 1st Ed. 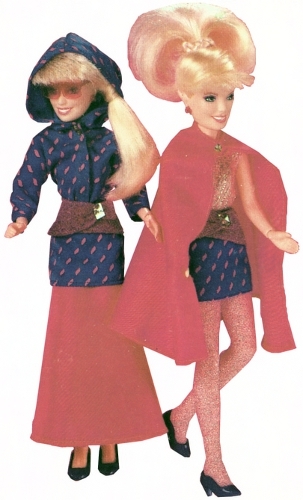 Jem-Jerrica, Star Capped version, not this fashion. How these differ from the Fire & Ice tights variant, I do not know. I have been told some people got Glitter 'n Gold Jem tights with their fashions. I don't think this is common. 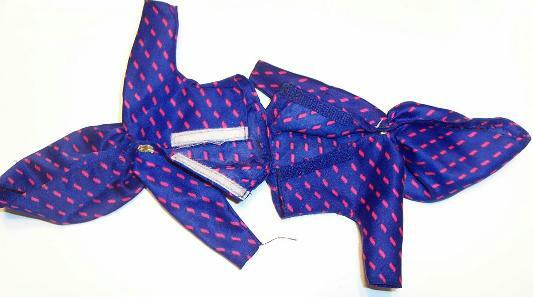 I have found a piece of clothing from some other line of dolls made of this material. sunglasses: square style, violet red hue. Packaging Variants: A listing of the packaging that Broadway Magic can be found in, that I know of, so far! *I don't own this fashion NRFB so I can't say which, if any posters and inserts originally came with it. Anything in Italics I haven't actually seen but have good reason to believe exists. If you have any photos or information/corrections to share, I'd love to hear about it! 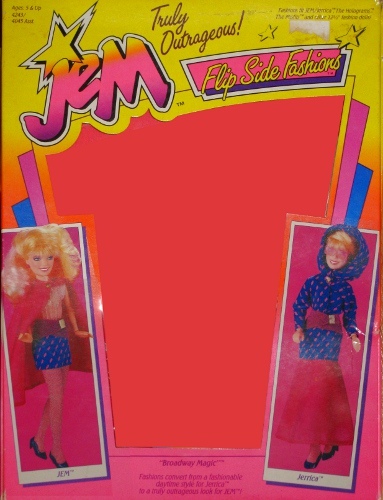 To read more about the differences in the fashion packaging, please go to Jem Fashion Box Variants. 1987 Hasbro Box Photo #1, see top of page, same photo is used on the backs of the 1987 Flip Side Fashion boxes, 1987 US Hasbro Toy Fair Catalogue (though Jem & Jerrica have been manipulated to be standing reversed), 1987 France & UK Toy Fair Catalogue and the 1987 Jem catalogue poster) -other than looking a fair bit redder than it actually is, looks like the produced version. 1987 Hasbro Box Photo #2, from Broadway Magic box front - appears to be the same outfit as Photo #1, in different poses/hairstyles. -other than looking a fair bit redder than it actually is, looks like the produced version. Illustrations: Cartoon (Shown left, This is a reworked version of the original model cel, which can be viewed on Felicity-Chan's cel gallery) Jem's half is worn by Kimber on the cartoon. Credits: Thanks to Glamour to Divaz for letting me photograph most of the outfit parts, thanks to Tommy/ng.59 for the information about the velcro colour differences. Thanks to Thumper for the information on the Glitter 'n Gold tights variation. Thanks to Janet for the box photo.